Have you ever tried Caucasian cuisine before? If your answer is no, then you cannot leave Russia's Northern Capital without sampling some Caucasian dishes. If you are planning your first trip to St Petersburg in Russia, you'll certainly be interested in tackling Russian dishes. That's fine! But you shouldn't stop there. In fact you should also try the food from the former Soviet republics, such as Georgia, Armenia, Azerbaijan, Uzbekistan and Kazakhstan. Uzbek restaurant in St Petersburg Russia serving Caucasian cuisine. Generally known as Caucasian cuisine and very popular with Russians, this type of food is made up of various dishes of grilled skewered meat, fresh vegetables, soups, bread and fruit. The dishes often taste and look different because each country has their own peculiar techniques for cooking and distinctive flavors. Thus, if you have had enough of stodgy Russian cuisine and want to taste something new, then our list of Georgian, Uzbek or Armenian restaurants below should satisfy your palate as well as your culinary curiosity. Tip: If you decide to try Caucasian cuisine, we recommend that you order the following popular dishes: Shashlik (grilled kebabs), Khachapuri (cheese stuffed bread), Satsivi (chicken in walnut sauce), Khinkali (giant meat-filled dumplings), and the Plov (rice with lamb) or Lagman (thick noodle and meat soup). Also, make sure you book a table before you go. Authentic Home Style Georgian Cuisine, Great Performances, Very Affordable! The Adzhabsandal restaurant is a cozy and home-like Caucasian restaurant offering authentic home-style Georgian dishes. Centrally located, here you can find a good selection of wines, and enjoy traditional Caucasian cuisine and national live performances. Ambience, food, and the staff will make your dining experience memorable. Definitely the best and authentic Georgian restaurant that we have found in the city. If you go, try the Khachapuri. Excellent Caucasian cuisine, Lively atmosphere, Good service! On the 4th floor of the large mall Galleria you can relax and try high-quality Caucasian cuisine at Baklazhan, a popular and busy restaurant offering a mix of delicious Georgian and Uzbek delicacies in a classic Caucasian-style setting. From a wide range of vegetables, fruits, drinks and meat to a lively but pleasant atmosphere, at Baklazhan your stay it is destined to be amazing. This location is perfect for people who want to do shopping and have dinner in the city centre as it is close to the subway station. Different Caucasian cuisines, Pleasant atmosphere, Traditional setting! If you are touring along Nevsky Prospekt and start to feel hungry, why not plan a visit at Mamalyga, one of our favorite St Petersburg restaurants serving Caucasian cuisine. The authenticity of the food, the atmosphere and welcoming staff at Mamalyga will take you on a sublime journey into the heart of the Southern Caucasus. The names on the menu read like a tour of Caucasian culture that will transport your taste buds to different Eastern regions, such as Georgia, Imeretia, Armenia, Adzharia and Megrelia. The restaurant Mamalyga is definitely your best chance to try all kinds of food from different regions of the former Soviet republics in one place. Vast selection of unique food, Nice atmosphere, Elegant interiors! Tarkhun is another popular Caucasian restaurant in St Petersburg which is named after the herb tarhun, which is known as tarragon in the USA. Slightly off the beaten track, but not hard to find, this is one of the best places to go to sample authentic Georgian food and fine wine. But the vast selection of food and wine is not the only thing you'll love about dining here. The elegant interiors made of ivory coloured walls, the nice atmosphere and welcoming staff will make your dining experience very pleasant, and maybe this will inspire you to visit Georgia. Georgian cuisine, European songs, Reasonably-priced food! Georgian-themed cabaret CAT restaurant is famous for three things in the heart of St Petersburg: a barbecue, khachapuri cheese-filled bread and Georgian wine. Its musical café atmosphere and soft lighting puts you at ease, as patrons dance along to the best of European pop hits. Tourists from across the globe have given its reasonably priced food rave reviews, such as the pkhaly (eggplant with walnuts), khochapury (a variety of meat kebabs), satsivi fish as well as Georgian cheeses and desserts. The cat’s relaxing vibe is ideal for dates or catching up with friends. A paradise for carnivores with unique food and atmosphere! Named after a city in the Republic of Dagestan, Sumeta is one of St Petersburg's less known restaurants, but also one of the most intriguing. 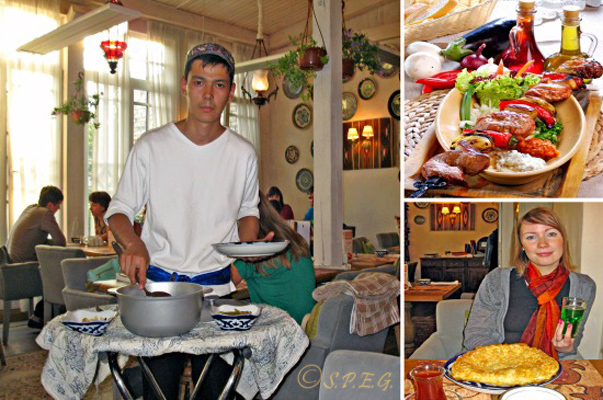 Serving Dagestani food with a twist of Caucasian cuisine in a uniquie setting that is somewhat cavernous, with walls composed of layers of hand-sized tiled rocks and even a cascading fountain, this unique establishment can be a real paradise for carnivores. Unlike many ethnic restaurants in Saint Petersburg, Sumeta keeps an atmosphere of authenticity. Definitely a good dining spot for meat lovers! Best Caucasian cuisine, Good atmosphere, Spectacular interiors! Opened in 2000, the Karavan restaurant has long been considered one of the best restaurants producing national cuisine. From the stuffed camel, the Turkish carpets and the variety of Kebabs cooked in the middle of the room to traditional starters, such as Sacivi and Lobio, Basturma and Khachipuri, here you can have a good taste of the Caucasus and Central Asia. Definitely another interesting place for meat lovers or those who want to try excellent Uzbek, Azeri or Georgian food served in large portions in a quiet atmosphere. Delicious Georgian Cuisine, Nice Atmosphere, Charming setting! Aragvi restaurant is a little gem where anyone can have a wonderful lunch or dinner in a relaxing and quiet atmosphere overlooking of the Fontanka River. The Chef here, the owner's mom, cooks authentic and delicious Georgian cuisine with her golden hands. The charming interior decoration, cozy atmosphere and variety of tasty Georgian dishes will make your dining experience at Aragvi enjoyable and you will leave feeling happy and satisfied. Great Service, Tasty food, Cozy decor and good prices! Even if you haven't eaten Armenian cuisine before, we are sure that at Kilikia you will find something familiar and satisfying. Named after the Armenian region within Turkey, this nice homelike cafe-restaurant located on the bank of Griboedov Canal serves delicious Armenian food mixed with different fruits and spices found in the Caucasus Mountains, all cooked by locals. Without doubt, a dining experience at Kilikia will give you the true feel of Armenia and the people's warm and welcoming hospitality. But that's not all - here you can also sample some dishes of European and Mediterranean cuisine! Great location, Authentic Georgian food, Amazing interiors! What awaits you at the Kavkaz-Bar can be summed up in just one word: “unforgettable”. Firstly, the Caucasian cuisine served at Kavkaz-Bar is legendary. Secondly, all of the dishes are home-cooked according to traditional recipes by the Chef, a Georgian master of his craft. Thirdly, this restaurant is unforgettable because of the cozy and tastefully decorated interior which features Georgian pottery and tapestries to create an authentic atmosphere. So if you decide to go, undoubtedly you will have a pleasant evening and a unique culinary experience! Peculiar local cuisine, Impressive setting, Great hospitality! The restaurant Kish-Mish is a little, cozy corner of Azerbaijan that will make your dining experience a really pleasant one. The restaurant's interior, made of handmade rugs on the floor, cushions on soft couches, pictures of old Baku and antiques brought from Azerbaijan, will intrigue you. The delicious home-cooked food from Georgia and Azerbaizan, created with authentic Azeris food, along with the prestigious local wine list, will both please your palate and soul. In short, this is the kind of place you'll be talking about long after you've gone home! Great Georgian restaurant, Authentic food, Relaxing atmosphere! If you want to try new flavors and love spicy, rich and hearty food, then you should book a table at the popular Georgian restaurant Tbiliso. From more than a hundred traditional dishes of Caucasian cuisine to rare dishes of Imereti, Adjara, Kutaisi and Ossetian cuisine, here you can try new types of food and experience the best warm Georgian hospitality. The live music, local costumes, friendly staff and nice atmosphere will make your dining experience at Tbiliso memorable. High-quality Caucasian cuisine, Amazing interiors, Special atmosphere! Awarded the best restaurant in St Petersburg in 2007, Erivan today is still seen by many locals as one of the most luxurious ethnic restaurants in the city. Offering a variety of traditional Armenian food cooked by local chefs who put their soul, passion and tradition into every dish, here you can expect top-class service and food along with a special atmosphere. Everything you see on the table or on the wall is hand-made by Armenian craftsmen, while all of the dishes are homemade, fresh and of course very tasty. Add all of the elements of romance and luxury and bingo... you're certain to make the most sumptuous memories at Erivan.